Baptist Hospital, CE Broker provider # 50-183 approves this program for 6 hours credit for nurses, occupational therapists, radiology technologists, and physical therapists. 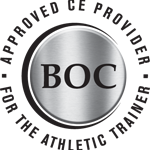 Andrews Research & Education Foundation (BOC AP# P10024) is approved by the Board of Certification, Inc. to provide continuing education to Athletic Trainers. 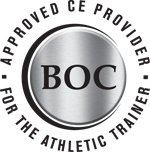 This program is eligible for a maximum of 6 EBP Category hours/CEUs. ATs should claim only those hours actually spent in the educational program. Andrews Research & Education Foundation has been approved to offer 6 hours of CRCC continuing education credits.